Arc mobile has just announced that they will release another Phablet anytime soon. 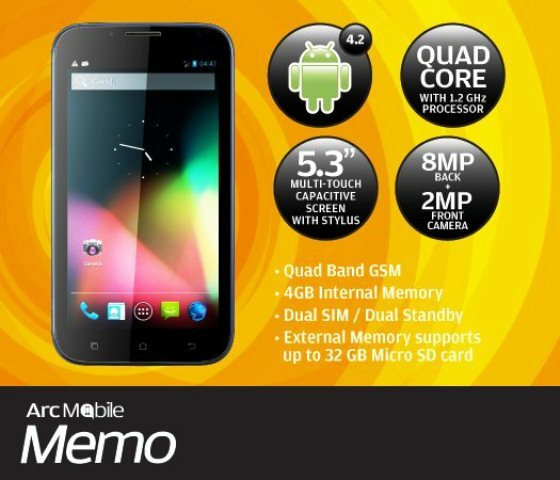 Introducing Arc Mobile Memo, a 5.3 inch Phablet, powered by Android OS, and Quad Core. Arc Memo is bound to dominate large screen smartphones. Believe it or not, Arc Mobile Memo has been made for budget conscious people, though the price is still yet to be announced, rumors says if will be sold for Php6,200 SRP, since its not confirmed yet, we will focus now on its specs, and what can Arc Mobile Memo really do to impress us. Luckily, I have found a huge list of its specs, well some of them may not be that accurate, but still these specs will likely be true. Dual 3G - Most of Dual SIM capable smartphones are just single 3G, while Arc Mobile Memo will feature a Dual 3G mode on its two SIM slots. 5.3 inch display - Can't we get enough of this? Well, since Arc Mobile Memo will be the first 5.3 inches Phablet phone in local standard. Large but affordable - Is this a feature? Of course! 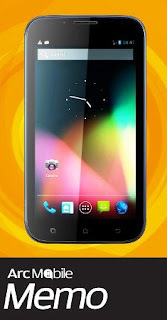 No other local brand will offer for most affordable than Arc Mobile. And that goes for most of their products. FM Radio - This might sound classic, but most high-end smartphone has remove this feature. It might come in handy sometimes. For Php6,200 (Estimated price), available on Arc Mobile stores, and Kiosk this August 2013. What can you say about Arc Mobile Memo? Kindly share your thoughts about this amazing Phablet, and stay tuned for more info later. This seems nice phone, but what about its battery backup.